Get even more mind-expanding power for your keyboard, bass, guitar or vocals with the Behringer Virtualizer High Performance 3D Multi Engine Effects Processor. Get even more mind-expanding power for your keyboard, bass, guitar or vocals with the Behringer Virtualizer High Performance 3D Multi Engine Effects Processor. 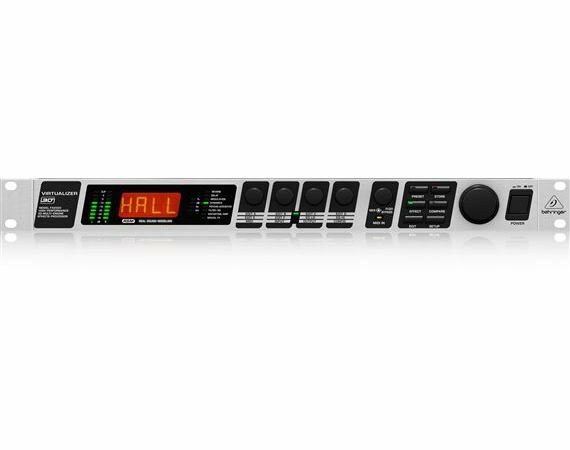 This amazing rack unit has 71 incredible new algorithms, including true studio-grade stereo and 3D effects that will add a head-spinning new dimension to your sound, both live and in the studio. The FX2000 employs Behringer RSM (Real Sound Modeling) technology to simulate acoustic environments with stunning accuracy. Effects options include powerful modulation, amp simulation, distortion and special effects, as well as effective dynamic and psychoacoustics processing. Performance is further enhanced through user-addressable high and low EQ and wave-adaptive VIRTUAL ROOM reverb algorithms. The FX2000 has some of the best-sounding reverb and delay programs, but that’s not all. It also provides excellent modulation effects (such as chorus, flanger and phaser), including special variations like musical pitch shifter, tremolo and even a rotary speaker simulation. Distortion FX and Amp Simulations. The FX2000 is also equipped with distortion, amplifier and speaker simulation including VOCAL DISTORTION, TUBE DISTORTION, GUITAR AMP, TRI FUZZ, SPEAKER SIMULATION, RING MODULATOR and LO-FI. Our FX Combinations Go to 11. Sometimes you want to add a little (or a lot) of color to your reverb and delay patches. The FX2000 allows you to layer modulation effects like chorus, flanger, pitch or tremolo with your reverb or delay selections. Definately what I needed to gain better sound for my recordings! Looking for a device to apply sound effects to guitars and vocals. There's plenty of sounds to choose from and they all sound really great. You won't be disappointed especially for the price! I purchased this unit based on some unboxing review videos. I'm a sax player and I've used a standalone effects pedal for some time. I've been debating whether to create a pedal board or including an effects processor in my rack. So I decided this would probably be the least expensive and maybe better option. I'm just starting to use this but so far its great. This is an excellent effects processor. I am a Sonidero (Mexican DJ). Every Sonidero that I have met usually has one of these along with a Lexicon MX200. Almost all of them prefer to use the Behringer unit and only keep the Lexicon as a back up unit. I have been using this unit for the past few weeks since I purchased it and it has performed flawlessly. It exceeds my needs and if it were to die out or someone stole it from my rack, I would definitely purchase another one without hesitation. I like the effects, the presets sound great, the parameter changes and building presets are a pain. I haven't sat down with the manual yet, but I dont care much for the controls yet. I am use to the tc electronics m-300 which is a breeze to program, I'd say that the tc electronics m-350 would be a great choice if your just looking for reverb and delay but I will say that the fx2000 does have way more under the with modulation, distortion, filter and eq. Does a lot! Bit of a learning curve but I have had it a couple weeks and have been using it on microphones for live practice vocals. This thing is powerful and versatile. I've got a pretty good understanding of the unit now and look forward to unlocking the full potential of this thing and learn more. Cant wait to experiment with keyboard and drum mics. Great product for this price point. Great product for the price. It was purchased for a home studio. So I can’t really speak on how well it’ll hold up with the normal wear and tear associated with playing gigs. It seems pretty solid in its construction. The variety of effects are nice and suitable for guitar, bass and vocals. Really though at this price it’s hard to go wrong. If you are going to use it for live playing I’d suggest getting the foot switch FCB1010. This was exactly what was looking for!!! Has so much to use, mic, guitar, bass...the possibilitys are endless. This is a very good product. I bought this to have two separate effects processors in my arsenal. One for studio (Alexis MidiVerb 4), & another for sound reinforcement & performing on the fly/road (this Behringer FX2000). I got to futz w/ this prior to doing sound for a band, 5 weeks ago, along w/ my newly purchased Behringer NU1000 amp & my Mackie Mix 12 mixer. This FX2000 is quite easy to use, & gives you a list of all the preset channels for easy location, plus LED indicators showing Reverb, Delay, Chorus, etc. I have not test user banks yet, but will in the future. However, I was able play w/ preset settings in order to test w/ built-in effects on my Mackie. Everything was simple to use w/o incident. When I used this FX2000 LIVE, a week later, I got huge compliments on the sound I did for the band that night. I ended up keeping it very simple, using the reverb off the Mackie & the delay on the FX2000. Nice & simple! Plus, I am not huge using computer type effects.